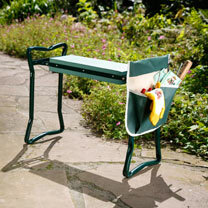 Take the strain out of gardening with this comfortable Garden Kneeler. Complete with a convenient pocket with 7 compartments to keep your tools close at hand, the kneeler can also be flipped over to provide a moveable seat so you can gardedn in comfort. Made from tubular steel painted green and soft foam for the kneeler and seat, it can be folded flat for easy space-saving storage. Dimensions: 28cm (11”) x 59cm (24”) long x 48.5cm (19”) high.